Meeting a disabled individual's needs often requires creatively combining physical, medical, emotional, and social measures. Sometimes a medical problem can be avoided or corrected through certain physical measures. For example, spinal-cord injured persons often develop kidney stones. This problem can be largely avoided by (1) drinking lots of water, and (2) standing for a while each day. Persons with an injury at a relatively low level of their spine (whose arms are not affected) may be able to stand (and walk) with leg braces and crutches (see Chapter 36). Those with higher-level injuries (arms also affected) may need to stand in a standing board. This can simply be a wide plank onto which the person is strapped and then tilted upright. An added advantage to standing daily is that supporting the body's weight on the legs helps to keep the bones growing, prevent osteoporosis (weakening of bones due to loss of calcium), and reduce the chance of fractures. 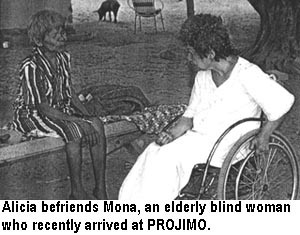 ALICIA, whose story is told in this chapter, is a warm-hearted older woman now living at PROJIMO. Her physical ability is quite limited, but she helps out, both with self-care and with several work activities that she is able to do with her spastic arms and hands. Although she works slowly and with difficulty, she is very patient and loves feeling useful. Our main focus will be on an unusual series of measures to help Alicia overcome a chronic urinary infection. As you will see, the problem had a complexity of causes, ranging from hot weather to spastic ankles, and from some personal embarrassment to a shortage of staff. Solving the problem required measures beyond what health workers usually consider when trying to manage urinary infections. Alicia's life has not been easy. Until the age of 8, she lived as most village girls do, attending school and helping with house work and other tasks. Then she fell ill with measles, which led to meningitis. This caused a physical disability similar to spastic cerebral palsy. 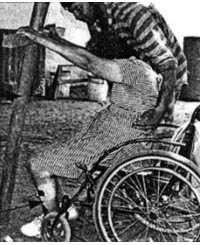 She could not walk, and it was hard for her to sit up or attend to her personal needs. Although her spastic mouth and tongue affected her speech, her mind was alert. Her mother took good care of her, exercised her as best she could, and carried her lovingly from place to place. But, when she was 18 years old, her mother died. Alicia was dutifully but reluctantly taken in by an older sister who was overworked caring and providing for her own children. The sister kept Alicia on a cot covered with a plastic sheet. She slept, ate, went to the bathroom, and spent her days and nights lying on the cot. Her sister fed, bathed, and changed her. When folks at PROJIMO first learned of Alicia, she had already spent 16 years lying all day and all night on the cot, her body and limbs becoming stiffer and stiffer. The PROJIMO team visited Alicia, gave her a wheelchair, and met with the family. They explained the importance of taking Alicia outside and having her eat and interact more with the family. But each time they visited, they found the wheelchair unused and Alicia still lying on the cot. Finally, the team invited Alicia to stay at the village center. At PROJIMO, with the help of exercise and simple activities, Alicia's body and arms gradually became more flexible, although her severe spasticity still prevented her from doing many things. Some of the best therapy was achieved by encouraging her in different aspects of self care. Little by little, she learned to slowly push her own wheelchair. 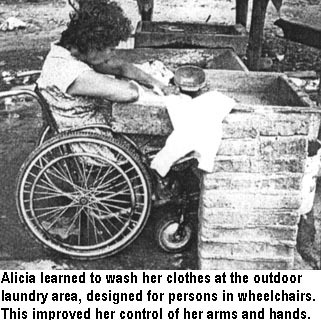 Alicia is still quite limited in what she can do, and needs help with many daily activities such as dressing, bathing, and transferring from her wheelchair to the bed and toilet. But compared to her previous situation, she says, "I feel like I have been set free from prison!" 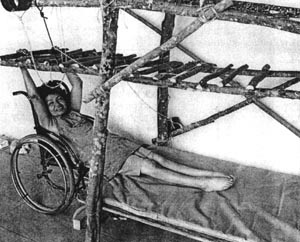 One of Alicia's wishes was to be able to move from her wheelchair to a bed by herself. A visiting physical therapist thought this would be impossible, because of Alicia's extreme spasticity. However, the PROJIMO team decided to give it a try. They built a rack of poles over a bed that they improvised. Lalo, a village therapy assistant, helps Alicia to find a way to lift her legs onto the bed. She did this by putting her feet in plastic rings, and pulling on a rope. After several weeks of practice, Alicia learned to pull herself onto the bed. It was a lot of work for her, but she enjoyed the attempt to become more self-reliant. 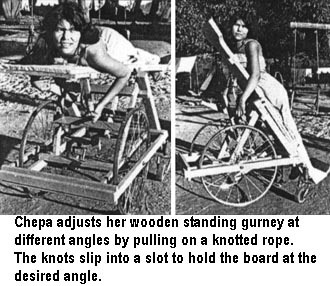 Also, the exercise helped all of her body functions, including her bladder and bowels, to work better. In early summer, the temperature in the village of Ajoya rises to a sweltering 115 degrees Fahrenheit (45 degrees Centigrade). This is especially hard on spinal-cord injured persons, whose bodies usually do not sweat below the level of their spinal injury (in the part of the body that is paralyzed). To prevent dangerously high fever, such persons must drink very large quantities of fluids. Also, their bodies must be kept at a normal temperature by wetting them continuously and fanning them almost constantly. In very hot weather, urinary infections are more common, even in non-disabled persons. They lose so much water through sweating (and breathing) that very little urine is passed. The dark, concentrated urine that remains in the body for long periods permits rapid breeding of infection-causing bacteria. Again, during hot weather: spinal-cord injured persons, children with spina bifida, and others who tend to have frequent urinary infections, are at especially high risk of bladder or kidney infections. Although the body of a spinal-cord injured person may sweat less than normal, in hot, dry weather he still can lose lots of water, just through breathing. Breathing, like sweating, is one of the body's cooling mechanisms. Each time we breath in, water evaporates from our lungs into the air. Evaporation cools. The lungs cool the body, just as does a home air cooler that blows air through wet cloths. Through breathing, in hot dry weather a person's body can lose two or more liters of water a day. To reduce the risk of high fevers and urinary infections, in hot weather a spinal cord injured person must drink many liters of liquid a day. A plastic spray bottle, used for watering plants, is excellent for providing "artificial sweat" for helping to cool the person who does not perspire norrnally. 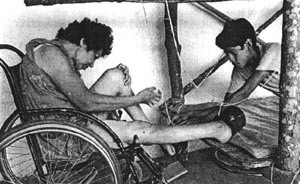 The bodies of persons who are quadriplegic (spinal-cord injured at neck level) do not sweat. In hot weather, they risk dangerously high fevers and urinary infections. Here, a boy sweats artificially by spraying himself with water while he fans himself, He must also drink many liters of fluid every day. In hot weather dogs pant because they do not sweat, To cool their bodies, dogs "sweat" through their tongues and their lungs. Panting moves the air rapidly over their moist tongues and lungs, speeding evaporation and cooling. A good way to be sure that you are drinking enough fluids is to frequently check the color of your urine. It should be almost as clear as water, or only slightly yellow. Dark or cloudy urine is a sign of danger. 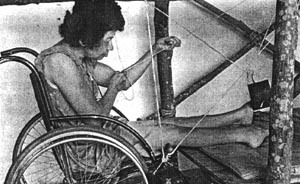 Spinal-cord injured persons, who do not sweat normally, need to sweat artificially by frequently spraying their bodies with water and fanning themselves. Especially for quadriplegic persons, who suffer greatly in very hot weather, continuous wetting and fanning during a heat wave can be life-saving. Last summer when the heat became oppressive, Alicia began to complain of low-back pain. She said her feet were more swollen than usual, and the stiffness of her body had increased. Mari suspected a urinary infection. She thumped Alicia's back along each side of her spine. When she thumped on the mid-lower back, over the kidneys, Alicia gasped with pain. Her urine was dark and cloudy. These are signs of urinary infection. "Drink lots of water!" was Mari's first recommendation. "A large glass, every 15 minutes, as if it were medicine." Mari knew that many urinary infections clear up, simply by drinking large quantities of liquids. The abundant flow of water (dilute urine) through the body's plumbing system washes out most of the microbes that cause infection. Then the body's defense system gets rid of most of the rest of these microbes. Obstacles. Getting Alicia to drink lots of water was easier said than done. A series of obstacles - physical and psychological - needed to be resolved. 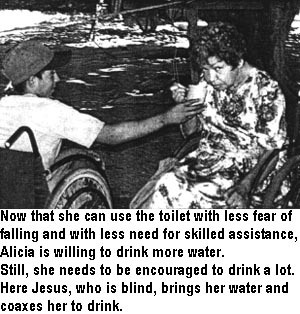 First, Alicia drank very little water because when she drank she needed to urinate more often. Due to her urinary infection, she had to urinate often in any case. And urinating was often painful. Even when people offered her different tasty drinks, she would say, "I'm not thirsty." She did not want to urinate often because she needed help to use the toilet. 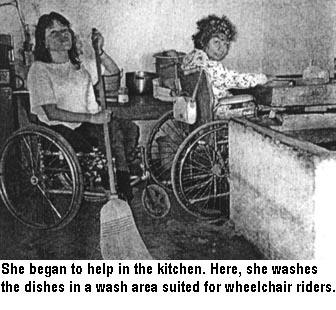 Someone strong enough, usually Rosa, had to lift her spastic body from her wheelchair and shift her to the toilet. Rosa was always busy washing clothes and doing other chores. Alicia felt bad to repeatedly have to ask Rosa for help with toileting. Still worse, transferring to the toilet was now more difficult, because Alicia's urinary infection increased her spasticity. 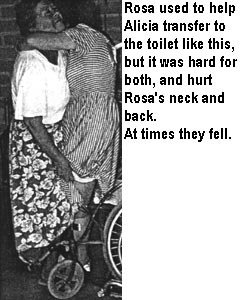 To transfer, Alicia would put her arms around Rosa and Rosa would help her to stand and pivot her sideways to sit her on the toilet. But now, with the urinary infection, Alicia's body, arms, and legs were stiffer and less manageable than usual. When she tried to stand, sometimes her ankles would twist sideways, and Alicia would suddenly fall over, dragging Rosa with her. Alicia was worried that either she or Rosa might be injured. Rosa, too, was concerned that she could no longer transfer Alicia safely. For all these reasons it was hard to convince Alicia to drink more water, despite the discomfort and poor health caused by her urinary infection. What to do? 2.Massage. To help Alicia reduce the stiffness of her body and stand more easily, Manuella, a village girl who learned some massage therapy from a visiting therapist, gave Alicia a daily session of relaxing massage. 3.Physical therapy. Inez, who assists with therapy, did a range of daily exercises with Alicia to help her to reduce her spasticity and improve her control of body movements. 4.Standing post - for exercise for more independent standing. To help Alicia to stand up more with her own force, and therefore to require less strength and skill from her assistant, Polo made a wooden standing post in the form of a cross. He mounted it firmly in the ground under a giant fig tree. After early trials and adjustments, he padded the cross to represent the body of an assistant. Inez helped Alicia to learn to pull herself to standing. Her stiffness and spasticity made this difficult, but Alicia gradually gained greater control. The ankle splints helped to stabilize her feet and prevent falling. 5.More persons to help Alicia transfer. 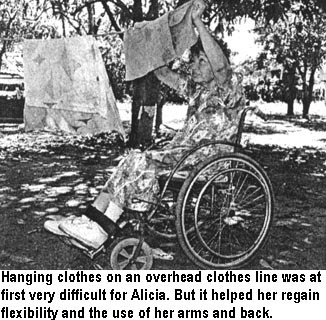 As Alicia's ability to stand and shift her weight improved, less strength and skill were required to help her transfer. Therefore more people were able and willing to help. Mothers and wives of disabled persons visiting the program were especially helpful. 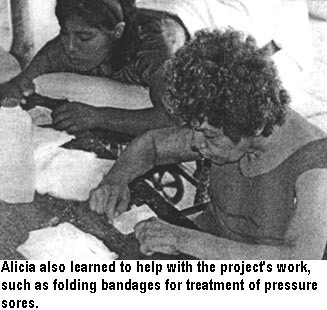 With more people ready to help her to the toilet, Alicia did not mind needing to urinate so frequently, and was more willing to drink more fluids. 6.Drinking more water. While all these procedures were taking place, everyone joined forces to coax Alicia to drink more liquids. So, every few minutes, someone brought her a glass of water, tea, or juice. Now that her toileting was less worrisome. Alicia began to drink more. Soon, her back pain went away, her feet became less swollen, and her spasticity was less debilitating. This made transfers to and from the toilet easier still. Healthy results. Thanks to all these measures - ankle splints, massage, a standing post, guided exercise, and more persons to help her to the toilet - Alicia recovered from her infection.